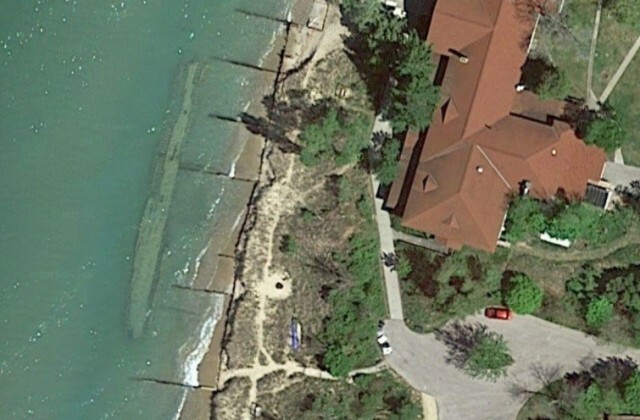 A section of the side of a large wooden vessel has been visible for decades just north of the entrance to the public beach at the foot of Lake Street in Arcadia, Michigan. Oral history has identified it as the Minnehaha, a four- masted schooner. 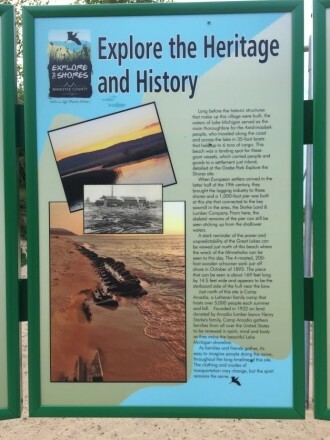 The Arcadia Historical Society website provides a detailed account of the loss of the Minnehaha and a marker near the public beach at the end of Lake Street tells of its story. 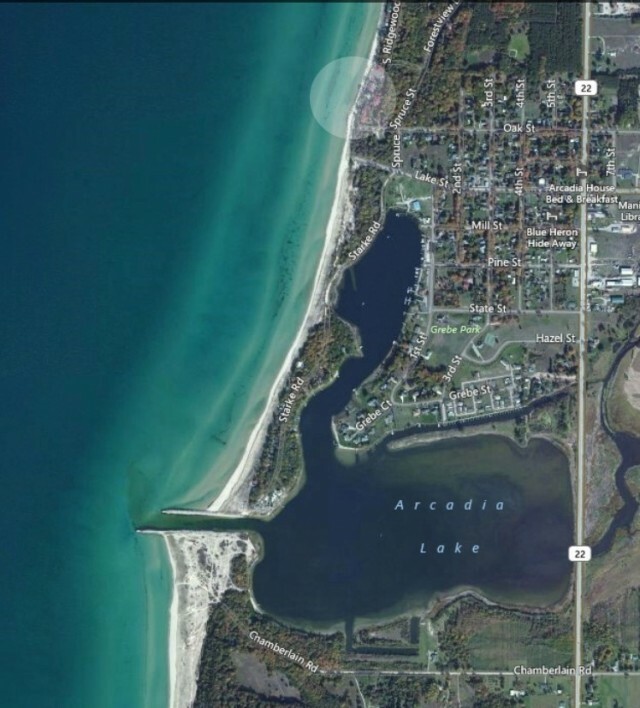 The Arcadia Area Historical Society explains its loss on its website: “In October of 1893, the steam barge Henry J. Johnson was towing the Minnehaha from Chicago bound for Point Edward at the south end of Lake Huron with 58,000 bushels of corn. At 7:30 PM on October 13, the two ships found themselves off Point Betsie facing 90 mile per hour gale force winds. They tried to find shelter behind the Manitou Islands, but at dawn the next day, they were still south of Sleeping Bear Point fighting high winds and waves to stay out of shallow water. Captain Benniteau of the Johnson decided to turn the ships south and head to Frankfort, the nearest refuge. However, somewhere near Frankfort high waves crashed over the Minnehaha‘s deck, smashed two hatch covers, and began filling the hold with water. William Parker, captain of the Minnehaha, realizing his ship was in serious trouble, sent up distress signals, released the tow lines, and headed for the beach. There was nothing the crew of the Johnson could do but avoid the same shallow water. The Minnehaha ran aground about a quarter of a mile offshore between Burnham and Arcadia. To avoid the waves sweeping the decks, all but one member of the crew, who drowned trying to swim to shore, climbed into the ship’s rigging. As the ship was breaking up, the captain called to the crew to grab whatever would float and go over the side anyway. But only the captain made it to shore safely. One crew member made it to a pier, but was too tired to hold onto a pole used to try to pull him to safety. People on shore rode by horseback to Frankfort’s lifesaving station and to Onekama to phone Manistee’s lifesaving station. The Frankfort crew arrived at 5PM, but repeated attempts to reach the vessel by surfboat failed. By the time they fired two shot lines over the bow, which was all that was visible by then, and reached the Minnehaha, there were no signs of life. Because their path was obstructed by trees blown down by the storm, the Manistee lifesaving crew reached the site at midnight in time to work with the Frankfort crew the rest of the night looking for survivors. MINNEHAHA Built April 3, 1880 Schooner – Wood U. S. No. 91220 822 gt – 781 nt 199.5′ x 35.1′ x 15.1′ Stranded between Frankfort and Pierport, Michigan, Lake Michigan, on October 14, 1893; 6 lives lost. The MINNEHAHA of Cleveland Goes Down And Only The Captain Is Saved. The Manistee Life Saving crew was called upon for assistance, the claim being made that the Frankfort crew could not be reached. A train was immediately made up, and the crew and boat taken to Onekama where the boat was hauled 10 miles through the woods to Starke. Upon arriving there at midnight The Frankfort crew was found upon the ground, having arrived just before dark, but too late to be of any service. The schooner MINNEHAHA had been thrown upon the beach at about noon. 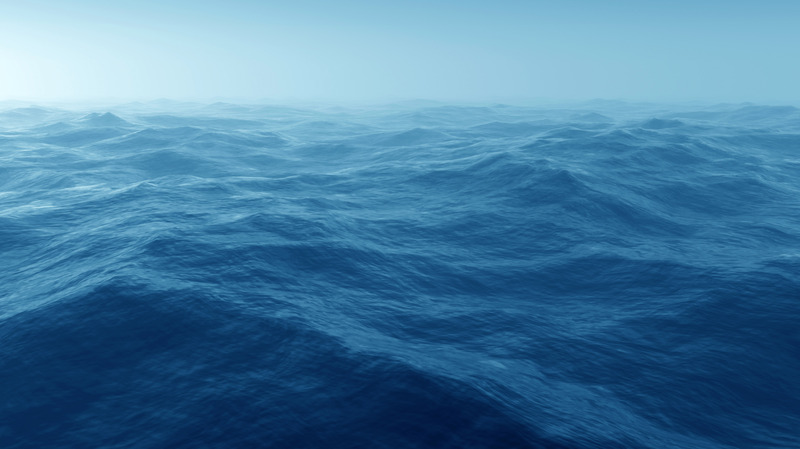 The sea was running very high and swept the decks clean, and the crew was all drowned except the captain, who jumped overboard with a plank and swam ashore. The MINNEHAHA was being towed by the steam barge HENRY J. JOHNSON, also of Cleveland, which became disabled during the storm. Captain Parker, fearing that he would go down in the open sea, cut the towline and put for shore. He refused to talk about the insurance and but very little information could be secured from him. He said he did not see the JOHNSON after he cut loose, but the boat was seen off Manistee passing south at 3 o’clock Saturday afternoon. “We left South Chicago last Friday with 58,000 bushels of corn for Point Edward. We were taken in tow off Chicago by the steamer HENRY J. JOHNSON. We proceeded down the lake on the regular course, but was caught in the fearful gale of yesterday. The steamer made a great effort to reach the shelter of Manitou Islands, but the storm steadily increased in fury, she could make no headway against the big seas, and finally we had to turn and run before it. “When off Frankfort, about noon yesterday, the great mass of water falling on the decks of the schooner broke open two of the hatch covers. Then the water began to run through the openings thus made, and we saw that it would be but a short time before the schooner must go down. We signaled, then we headed for the beach. We brought up about a quarter of a mile from the shore. Instantly the waves made a clean sweep over us and we all took to the rigging, except one sailor, who jumped overboard and attempted to swim ashore. He was drowned so quickly that the rest of us hesitated. 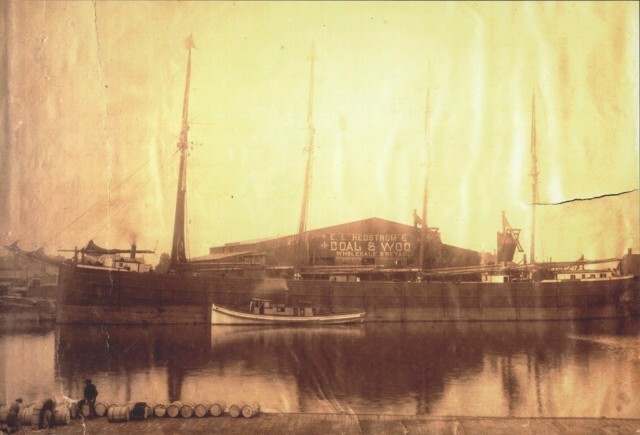 The lost schooner MINNEHAHA, was owned by H.J. Johnson and others, of Cleveland, and was valued at $25,000. She was insured for $13,000 with the Commercial Union, North America, the London Assurance and one other company whose name we could not be learned last night. She was built in 1880 and has been unfortunate from the start. Two years ago she was wrecked near Detour, and remained on the rocks all winter, being abandoned to the underwriters, who finally rescued the wreck and sold it. The MINNEHAHA loaded with corn went ashore on Saturday afternoon near Manistee. 6 killed, one saved. A few minutes after striking the bar the vessel broke in two and within half an hour nothing but the bow was left. There were no life-preservers on board. The barge J.D. SAWYER was cut adrift by the B.W. ARNOLD near the Beavers in the Saturday evening terrific gale. She is presumed lost. Eighteen were lost as the steamer DEAN RICHMOND goes down off Dunkirk, N.Y. She was chartered to the Toledo, St. Louis & Kansas City Line. The barge HECLA is ashore at Wellington, Ontario. The Barge J.C. MARTIN is ashore at Racine. The tug ACME foundered on Lake Huron near Black River. None lost. The schooners MORTON and CASTALIA are ashore near Sault Ste. Marie. The steamer E.P. CURTIS and tow, ISABEL REED, T.S. FASSET and NELSON HOLLAND are ashore near Cheboygan. The schooner CRAWFORD is ashore on Bois Blanc Island, Straits of Mackinac. The schooner YOUKON is ashore at Waiski Bay. The barges KNIGHT TEMPLAR and SWEEPSTAKES, consorts of the steamer SALINE, are ashore between Cheboygan and Duncan. The steamer JOHNSON, whose tow the MINNEHAHA was lost, has been found and is safe. All that’s left is wreckage that appears to be the starboard (right) side of the hull near the bow, a piece about 169 ft. long by 14.5 ft wide at the widest point, located north of the beach access at the end of Lake Street in Arcadia, running parallel to the beach. 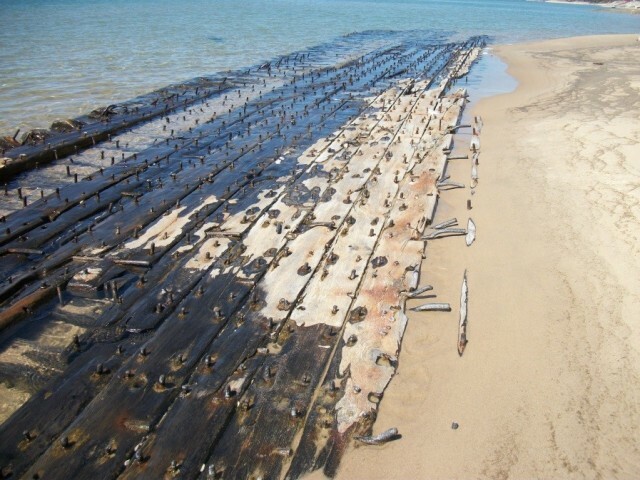 How much of the wreckage is covered by water and sand varies from year to year. In 1999 the wreck was under a foot of water as seen below. 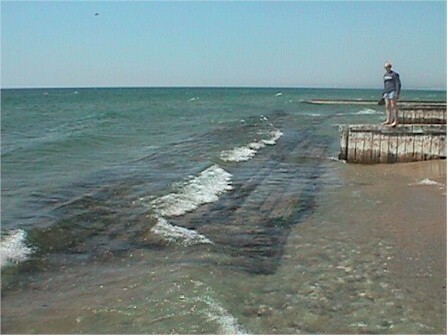 In 2011, during a period of low water levels, the wreck was on the beach as seen below. 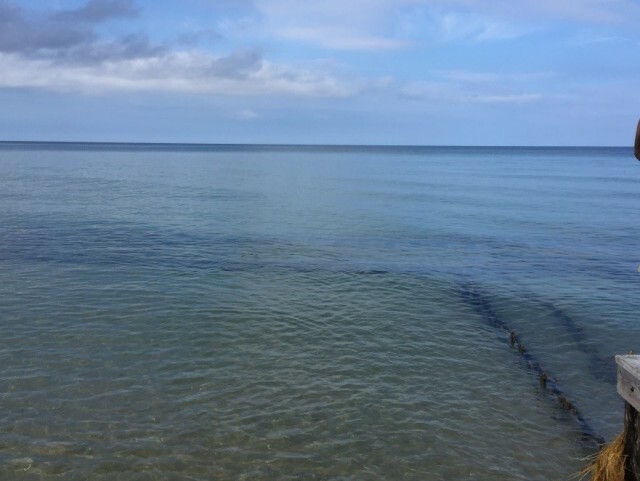 MSRA visited the site in the summer of 2015 and recorded the wreck still in the surfzone as seen below.